There already are two Butcher reviews here on VitalMTB, but since I am on the latest released-in-june-of-201829x2.6” GRID version, I thought that this was worth another look. The main differences are the sawtooth-shaped inside of the cornering knobs, and redesigned center knobs. The new center knobs have differently-oriented sipes and a sawtooth design on their sides that mirrors the corner knob’s shape. The version I have also seem lighter at 960g per tire instead of 1015g for the last reviewer’s pair. There already are two Butcher reviews here on VitalMTB, but since I am on the latest released-in-june-of-2018 29x2.6” GRID version, I thought that this was worth another look. The main differences are the sawtooth-shaped inside of the cornering knobs, and redesigned center knobs. The new center knobs have differently-oriented sipes and a sawtooth design on their sides that mirrors the corner knob’s shape. The version I have also seem lighter at 960g per tire instead of 1015g for the last reviewer’s pair. To start off, I bought those tires in the buy-one-get-one sale that Specialized had going on in the spring of this year. I couldn’t pass up the price, and they seemed to have everything I was looking for : tall center knobs, long-lasting but grippy rubber, straight-lined and constantly-spaced side knobs, a clear channel between the center and side knobs, and low-for-the-class weight. The tires were going to be used on my Marin Rift Zone that would see a lot of different trails and be ridden with many types of people, so they had to be pretty capable in all sorts of ways. I mounted them up on my WTB Asym i29 rims with tubes (yes, with tubes!) and it took a little while for the beads to seat properly. I always inflate a few psi under the recommended max pressure to make sure that the casing or bead won’t overstretch during installation. The next day, the tires had slowly taken their place on the rim, and there were no wobbles in the casing. 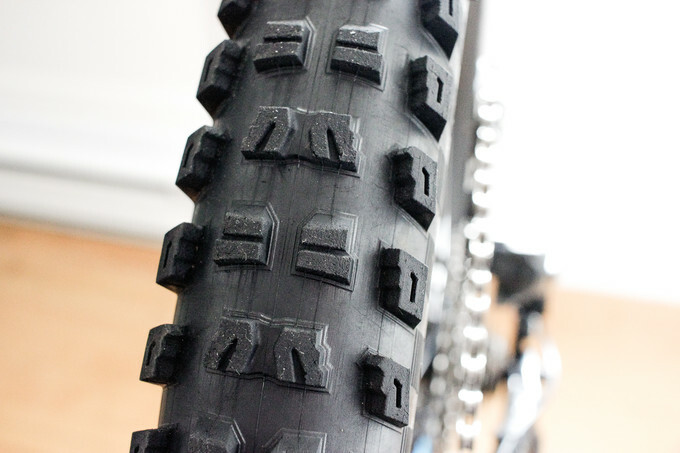 Speaking of the casing, it is a bit thinner than Maxxis’ EXO or E13’s TRS+ tires, but on par with Schwalbe’s Snakeskin. At 960g/965g each, they are on the lighter side of things for that kind of tire. Specialized indicates 2.6” on the sidewalls, and they use those tires on their new ’19 Stumpjumpers with 29-30mm internal width rims, just like mine. Even after a full summer of riding, my digital caliper still reads still indicate 2.37”at the widest point and the total tire height is the same as the 2.35 TRS+ tires that I was using before. That was perfectly fine for me since I knew what to expect after reading a few forum posts saying that they were smaller than the advertised size. I did not get the 2.3 since I thought that if people said that the 2.6 was more a 2.35-2.4, the smaller one would be closer to 2.1. A big 2.6” would have probably been tight in the rear triangle, but this one is perfect and leaves room for mud. Shape-wise, they are pretty round, which is usually a good thing. I say usually because I would have preferred that shape with bigger side knobs, à-la Michelin WildRockr2/E13 TRS. With those side knobs, a 35mm internal width rim would be better I think, probably stretching the tire to the 2.6” labeled size and making the side knobs pop out a bit more. The first few rides were mostly in the dry, and I was trying different pressures to find the sweet spot. Based on feeling, I started at 19psi front / 21 psi rear, but quickly decided to up the pressure a bit after flatting and flatspotting my rim on a sharp pointy rock. My favorite pressure was found to be 21.5psi front and 23.8psi rear (Thanks AccuGage!) and since then I haven’t had any problems with flats or rim dents. I don’t feel the tire squirming in the corners, and I think that the small side knobs folding is what’s felt when pushing hard. I have never drifted past my comfort zone and the tires never surprised me, which is a good thing in my opinion! At first, I found the grip a bit lacking when leaning the bike in corners, and I thought it could be because of the combination of the round shape, wide channel, and smallish side-knobs. I was used to Maxxis Minion DHR II 2.4 and Schwalbe Magic Marys, which both have a more predictable transition before hitting the side knobs, so I had to adapt for a few rides. This was more apparent in the wet, but I got used to lean the bike a bit more and it was good after that. It was my first season riding a 29er, so I probably had to adjust to the bigger wheels’ different lean angles. If the tread pattern works so well for Loic Bruni and Jared Graves, who am I to complain. Compared to the E13 TRS+ tires, the Butchers seemed to be made of harder rubber. Fingernail-feeling-wise, I would compare it to a dual compound or 60A Maxxis, but on the trail, they were more sure-footed than Maxxis’dual compound. The Butchers work very well in almost all conditions. From dry dusty rides, to rock slabs and damp fall conditions, I haven’t found many situations that this tire didn’t like. They were a bit slippery on wet roots and rocks, and that’s my only complaint. Even in the cool fall rides with close to 0 Celsius and less, I found that the grip was surprising for the cold weather and I expected them to slip much more than that. If a bit cautious in the wet, those tires are great overall, and they seem to last forever. I can’t comment on tubeless setup as I swear by tubes, but I guess that since the bead was pretty tight, they will seal up like more other tubeless compatible tires. Compared to Maxxis’ Double Down or WTB’ tough casing, I don’t mind the Butcher’s lighter casing as I wouldn’t like to pedal 1200g tires for 20-25 miles. After 350kms, they don’t have any side knob ripping, all the knobs are still sharp, and the casing hasn’t developed any wobble. I quickly got used to the tire’s shape, tread pattern and compound, and I expect them to still be good for at least another 300-350km.Two things would make them almost perfect in my opinion: a bit wider center knobs (like a Minion DHR II), and bigger side knobs (like the WildRockr2/E13). The new Eliminator tire from Specialized seems to cover those two things, so they could be another nice option to try. I have recently bought some leftovers E13 TRS Classic tires and also plan to try the recently-introduced Michelin Wild Enduro, which both combine what in my opinion could be improved on the Butchers, but in different patterns. Regarding the tubeless aspect, I'd say it was one of the easiest tires to set up (27.5 2.6" on an EX471 25mm rim and gorilla tape). Super grippy and love those side knobs. Slower rolling than many other tread designs. I am using the Specialized Butcher Grid tire in the 2.3" size as a rear tire rather than on the front. Most of my local riding is across dry and rocky terrain. Smooth flowing sections are broken up with short steep climbs and challenging descents. I am not smashing laps or railing bike parks so max speed is less of an issue than traction and reliability. 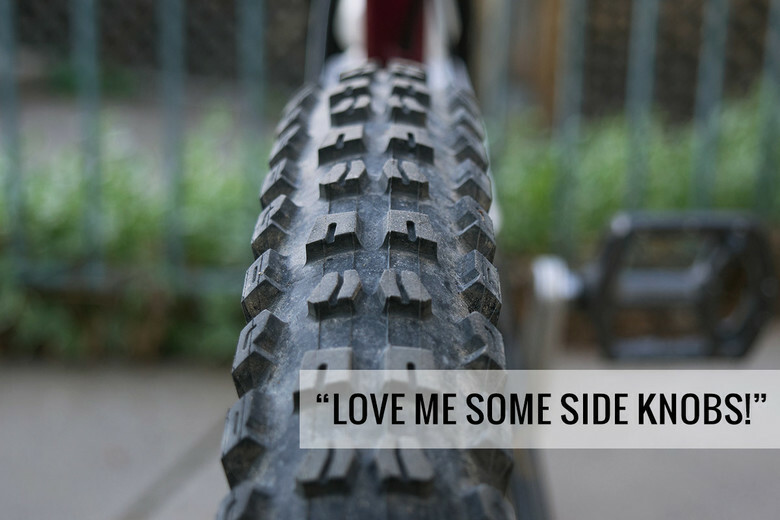 The tread design and rubber compound of the Butcher gives me the climbing and cornering traction that I am looking for in a rear tire. Just like running a DHF as a rear tire, you will feel a slight reduction in rolling speed, but it is well within reason for myself. The weight is in the sweet spot between 800 and 900 grams and the grid casing is very strong for that weight. Unlike many manufacturers that start with an "M", the claimed volume for Specialized tires are close to the actual measurement of the tire. I run it at 25-27 psi for my weight and haven't had an impact flat yet. Five stars! It is a spectacular tire for the price! Replaced my stock tyre with the Specialized Butcher GRID 2BR on the front. I haven't removed it and its going to stay there until I wear it out. Excellent traction and control in all conditions, even during the rainy season in the Philippines. -Grip so close to Minion DHF's that most mere mortals will never be able to tell the difference. -Great longevity. Tread and sidewalls seem to age at nearly the same rate, so no threadbare sidewalls while still lots of sciping left in the tread, or vice versa. -Mount up nicely tubeless, hold pressure well and keep sealant (sidewalls don't weep sealant like the control casing tires often do.) Never had one that would not mount with a floor pump. Usually they start to take the bead with the very first push of the pump. Don't think I have ever had to do the frantic pumping to get one to take. -Grid sidewall feels like it gives great support at reasonable tubeless pressures. -Take sidewall abuse as well or better than other protected type sidewalls like EXO, etc. I have 425 miles on a pair of 29 x 2.6 butcher grid tires front and back. These miles have included multiple trips to Moab, Hurricane/St. George and whatever is ride-able in northern Utah in between weekend road trips. I run these at 18-19 psi front and 19-21 psi rear depending on my pump, my mood and the trails I'll be riding. If I let it drop even a few psi below that and I'm pushing it on chunky trails I start to get rim dings, but have had no punctures or snakebites yet despite this. If you buy your tires from the same shop you buy your bike from you might even be able to nudge them down a bit on price from the already lower than other similar tires in the market price. Chance to support the LBS anyway. Regardless, of price, a tire that doesn't perform isn't worth the deal and these shine in both areas. Might try going to a Purgatory rear just to see if it's worth the slightly improved rolling resistance, but I don't see myself running anything but these anytime soon. Great job on these Specialized. I'm going full 5 stars for combination of performance and value. Claimed wiidth specs are accurate, Excellent grip, Great durability, A less expensive option than others. Pulling the Butcher tires out of the packing, they appeared to be just another Minion style tire. I opted for the 2.6” version for the 27.5” wheel size. The construction appeared to be well done and the rubber was semi tacky which in theory will offer excellent grip. In terms of weight, the size option I opted for were claimed to be approximately 985 grams. On the Park Tool table scale however, they came in at 1,015 grams. Not to bad considering they are a hefty 2.6” wide tire. Installing these tires was very straight forward. The bead wasn’t too tight and they seated to my Spank Spike Race 33 rims without any hassle. The most impressive part about these tires was the fact that they were very close to the claimed with of 2.6”. Granted, I know this varies per width of rim you install them on. Being a 2.6” speced width, they were pretty much designed for around 30mm internal width rims and that being the case, are true to size. The grip of the Specialized Butcher GRID 2Bliss Ready tires is very good, not the best out there but given that they are only $60 MSRP, they offer plenty of grip for ever penny spent. In terms of durability, They have outlasted any Maxxis tire I have ever owned. I think the minor lack of grip that they have give the much appreciated longevity for the life of the tire. The side knobs appear to remain intact with very little signs of wear. The tops of the center knobs have a few minor chunks missing but comparing them to Maxxis C3 tires, they have outlived them no question about that. The Specialized Butcher GRID 2Bliss Ready tire offers performance and longevity and a descent price. They are lightly heavier than their claimed weight but nothing outrageous there. Outside the their grip and durability, the fact that they are truly a 2.6” tire is awesome. If you are looking for something that lasts a bit longer than Maxxis tires or find yourself a little short on cash, the Specialized GRID 2Bliss Ready tire is a spectacular option! I'm running 29 x 2.6 front and rear that were the first ones in the shop when released in october 2017 and they are also a little smaller than spec. Leaving them pumped up to 45psi for 48 hour or so helped, but still not quite there. anyone finds the 2018 version of the 2.6 smaller than the 2017 first batch? i was installing on another bike, i found it to be significantly smaller. same width of rims. i do know that new tires looks smaller. Miscellaneous The latest generation of the World-Cup-proven intermediate tire, the Butcher GRID 2Bliss Ready, receives sawtooth faces on the tread blocks to increase stability under load and provide additional biting edges. This, in turn, improves rolling speed as well as control under hard braking and cornering. Meanwhile, our proprietary GRIPTON compound improves high-frequency damping, attaching the tire to the ground better on both small bumps and rough sections. The low frequencies of the rolling tire deflections pass through unfiltered, leaving no energy absorbed, keeping speed high. Once you ride this new Butcher, you will never want another tire for your gravity excursions. We recommend GRID tires for anyone seeking the utmost in flat and sidewall protection or additional stability.